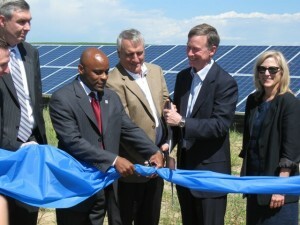 Another week, another energy company moving Colorado jobs overseas. This time it’s Encana, who is downgrading their Denver office from a US headquarters to a regional office. The Denver office of Encana Corp. will no longer be its U.S. headquarters but it will remain open, officials said Wednesday. The change comes amid a management shakeup at the energy giant, headquartered in Calgary, Alberta, Canada. Not so, say our sources. We’ve been told there is considerable chatter among employees that the change will mean Denver jobs being moved to Canada. If that’s true, it follows in the footsteps of Royal Dutch Shell, who announced last week that it was shuttering its Colorado oil shale operation to pursue ventures in Jordan and Canada. What we want to know is where is Governor Hickenlooper in all of this? He sure likes his ribbon cutting photo ops when businesses set up shop in Colorado, so it’s only natural he be made to explain why he couldn’t keep these jobs in Colorado. Bloomberg didn't tell him to.